In 2015 we celebrate the 750th anniversary of the birth of Dante Alighieri, one of the fathers of Italian literature and language. During the Renaissance the cult of the great men from the past was very strong. Around 1532, Agnolo Bronzino (1503-1572) was commissioned to paint the allegorical portraits of the \"Three Crowns\" Dante, Petrarch and Boccaccio. However, we don’t know what happened to the other two works. It is a lunette, an oil painting (oil on canvas, 130 x 136 cm). 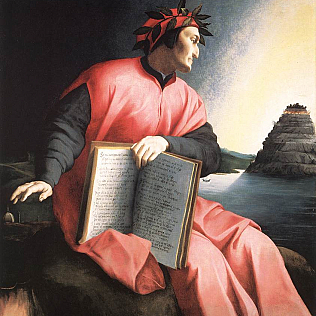 The portrait is allegorical, therefore represents Dante, with robe and crown of a poet. His left hand is holding his Comedy, opened at the ‘Canto 25’ of the Paradise. The poet has his face turned back, in a pose that adds drama to the context. He protects the symbols of Florence with his right hand, showing his belonging to the terrestrial world. His gaze, however, tends to the Garden of Eden and to the purification of the soul. With this new arrival, even the Uffizi Gallery pays homage to the greatest Florentine and Italian poet.